El Presidente returns in Tropico 6, the latest strategic offering from the crew at Limbic Entertainment. Before jumping into Tropico 6, I didn't imagine I would be spending nearly so much time in the game dealing with people. When I go into city building sims, I tend to think in terms of very basic rudiments, of building placement or available services, electric or sewer pipelines, things like that. Tropico is different: Yes, the player builds the nation and decides its layout, but overall success or failure is based on the happiness and relative comfort of the citizens within the nation as well as the relationships with countries outside its borders. Like here in the real world, Tropican citizens can be smart or dumb, effective or useless, and can contribute to the country or steadily drain its resources. Bringing the nation of Tropico into the modern era is a study of how to deal with its people's quirks, and I'm stunned at just how entertaining that can be. Tropico 6 allows players to view their nations from every possible angle. It's slightly coincidental: Before just recently, I had never played a Tropico game, and before Tropico 6, Limbic Entertainment had never developed a Tropico game. I came into the experience completely fresh-faced, but the developers were at least able to build upon the foundation previously established by PopTop Software and further refined by Haemimont Games. As far as I can tell, it's a solid foundation: Players assume the role of El Presidente, a government and political leader in charge of a small island nation named Tropico. By building businesses, stimulating trade, and focusing on the needs of the people, players will bring Tropico through the Colonial Era all the way into Modern Times. To make it that far, however, they'll have to satisfy a few specific requirements at set intervals. Aside from making sure the nation doesn't go completely broke and that its people aren't on the brink of outright revolt, players will have to work with outside forces to progress in the game. The Crown must be placated during the Colonial Era, or Tropico's mandate will expire and the game will end. When World Wars arrive, players must choose sides and keep up with evolving trade and citizen demands. By the time they've reached the Cold War era, Tropicans will expect niceties like electricity and automobiles, and new political factions will put pressure on the nation's policies. To reach into the modern era, players will have to establish Tropico as a world power in a climate marked by advanced weaponry and the rise of nuclear power. Game menus offer loads of detail about Tropican citizens. There's something very pleasing about guiding a nation through the generations. A population-first approach is paramount: I learned quickly that having loads of money didn't really count for much if my people weren't happy, and by the time I was forced to start satisfying more modern demands, the money I'd stacked up ultimately counted for nothing. In one instance, a misguided over-reliance on basic crops kept my people well-fed, but proved almost worthless when trade demands shifted and it came time to start focusing on health and safety. By the time I reached the Cold War era, my country was in debt, and without the funds to build a fire department, a single blaze set forth a chain reaction that took down everything I'd built. Of course, it is technically possible to play Tropico 6 and never really pay attention to the people themselves. Their desires, their happiness, their jobs and their homes are all available to see through in-game menus, but Tropico 6 actually lets players zoom in and watch any citizen they like. It almost seems silly, but it can be quite useful: In one game I'd thrown up a couple of gold mines and cheap housing hoping to make a quick buck, but months later the mines still weren't producing gold. I focused in on one of the employees to see why he wasn't working, and he had gone to the tavern on the other side of the island to relax. Due to how Tropico works, it took him weeks to get between both locations. I hadn't realized at the time that Tropicans needed to relax, but of course they do. I didn't realize they'd go so far for entertainment, but of course they would. They need the chance to chill with a nice drink as much as I do, and they shouldn't have to cross the nation to get it. I gave their hastily assembled shanty town a tavern, and they were happy to have entertainment close by. Then I gave them a grocery store, a chapel, a fire department; everything a normal person needs, all in relative proximity to what was never meant to be a big operation. And wouldn't you know it, they started working. They soon became rich, and before I realized what was happening, the little town I'd began as something of an afterthought was funding the entire country. Sometimes demands involve choosing between the whims of two rival factions. Keeping people happy is a great way to stay productive in a country dominated by shipping and general capitalist nature. With that said, Tropico lets players run their nation however they choose. They can side with factions like the Militarists or Communists, Allied or Axis forces, Eastern or Western powers, Industrialists or Environmentalists, the list goes on. My quietly rich island nation was but one possible direction; players can absolutely build an industrial empire, a tourist destination, a pacifist eco-driven paradise, or even establish a nation where radio and television broadcasts combine with countless billboards and military outposts to strip citizens of liberty and free thought. Again, this approach works on the broadest possible level right down to individual citizens. As El Presidente, players can fire employees, demolish their homes, assassinate political targets, and send out bribes. Similarly, the budget of any building can be adjusted to increase or decrease efficiency or happiness, political mindsets and affiliations can be manipulated through the media, and politicians can be hired to connect or distance the people from the island's government. Research can be used for new edicts that also adjust the nation's core values, budget, amenities, and more. Given such a broad scope, it's excellent to see just how well Tropico 6 is represented visually. The main screen becomes fairly convoluted as games wear on, but players can zoom all the way out for a view of the entire country or zoom all the way in on individual citizens. The detail is frankly tremendous in both graphical and text-based respects. It's entirely possible to sit back and watch trade happen in real-time, same as it's possible to open the Almanac and watch as citizens respond to new edicts and amendments. Even if the screen gets a little busy, there's always something to see or to watch, even if there isn't necessarily action to be taken. For better or worse, Tropico 6 is absolutely a game about waiting for the results of well-laid plans. Several overlays help players take advantage of natural resources. Considering that there's so much to do, see, or otherwise control in the game, it may come as no surprise that the menus in Tropico 6 can be a bit cumbersome. It's not that they're bad by any means; it's just that there are a lot of things players will need to learn. The tutorials do a great job of explaining the menus and their functions, but it's still not always quick to get around. Likewise, some menus don't have obvious options that players might expect to find — a list of goods being actively produced by the island would be a great addition to the Trade window, but alas, no such option exists. Thankfully, there are many different ways in which players can focus their experiences. The open-ended sandbox mode is great for general gameplay and will likely be the go-to for many genre fans, while special campaign missions focus players toward specific goals like building up a nation through piracy or creating an exceedingly extravagant tourist destination. Some of these missions tie into the game's theme of "borrowing" world wonders, meaning players can deck out their islands with such lavish decorations as Saint Basil's Cathedral or the Statue of Liberty. Through it all, though, there's one aspect of the game that very well could grow tiresome: Its music. 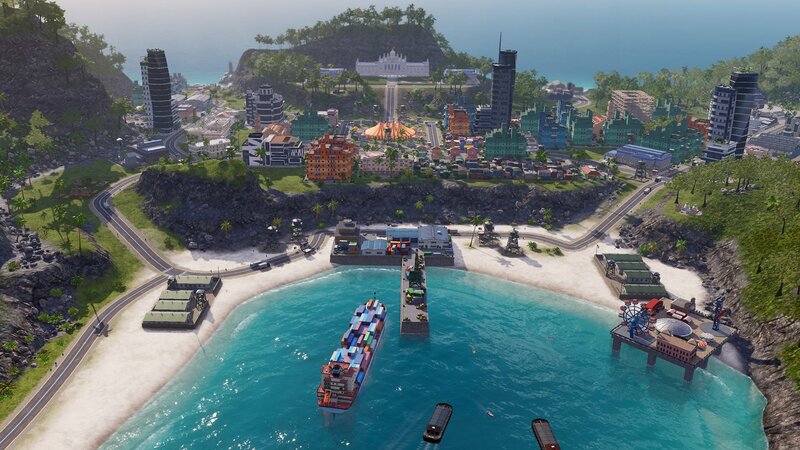 Tropico 6 has several great tracks with appropriate island-themed vibes, with a handful of really great tracks along with several other perfectly passable songs. The problem is that in a game that takes as long to play out as Tropico 6 matches do, many of those tracks will repeat over and over. And, if you're like me, they'll get stuck in your head, and you'll wind up hearing garbled Spanish-language covers on repeat inside your skull for hours after the game has been closed. Tropico 6 is the best game I've played all year. It reminds me of all the classic strategy games I used to love, and yet it doesn't make me yearn for them. That's because Limbic Entertainment managed to nail just what makes strategy games so fun. The latest Tropico release is great to look at, it's delightfully complex, and its zany and sometimes absurd humor helps make the whole experience so much more engaging than it might be otherwise. Simply put, strategy game fans owe it to themselves to check out Tropico 6. This review is based on a PC download code provided by the publisher. Tropico 6 is available for PC now, with an anticipated PlayStation 4 and Xbox One release later this year.